The Workshop on Conservation and Restoration of Urushi Objects was held at Museum für Ostasiatische Kunst, Museen Köln (Museum of East Asian Art, Cologne), Germany, from November 26th to 30th, 2018. Tokyo National Research Institute for Cultural Properties (TNRICP) has conducted the annual workshops with the cooperation of the Museum since 2007. The aim of the workshop is to preserve and utilize urushi objects (lacquerware) in museum collections outside Japan. 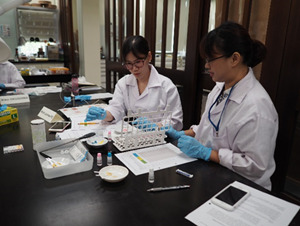 This year’s workshop was the basic course focusing on the knowledge and techniques required for storing, maintaining and handling the urushi objects, and six conservators attended from several countries around the world. The lectures included the chemical structure and properties of urushi, the structure and decorations of urushi objects, the typical damages and degradation, and the appropriate storage environment. Case studies on conservation and restoration of urushi objects in Japan were also introduced, and principles of restoration and processes of applied treatments were explained. The practical work on applying urushi to the wooden spoons helped the participants to understand the characteristics of urushi more clearly. Furthermore, the participants experienced the remedial treatment of an urushi object such as stabilizing the damaged areas and cleaning the surface. The ways of selecting and making of tools used in conservation were also explained. On the last day of the workshop, various topics, for example, the differences on conservation ethics and principles between the East and the West and the possible application of knowledge and techniques acquired in this workshop were discussed. It is hoped that introducing the fundamental knowledge and Japanese conservation techniques of urushi objects to the conservation specialists overseas will contribute to the safer preservation and utilization of the urushi objects overseas. 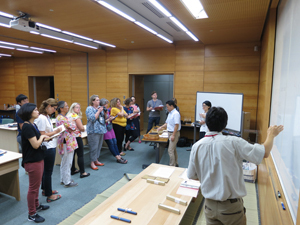 The International Course on Conservation of Japanese Paper was run from August 27th to September 14th, 2018. This course has been jointly organized by Tokyo National Research Institute for Cultural Properties (TNRICP) and the International Centre for the Study of the Preservation and Restoration of Cultural Property (ICCROM) since 1992. It is aimed at contributing to the protection of cultural property outside Japan by disseminating the knowledge and techniques of conservation and restoration of paper cultural property in Japan to participants from around the world. This year, 10 specialists in conservation from 10 countries (Argentina, Australia, Bhutan, Canada, Denmark, Fiji, France, Poland, the UK and Zambia) were selected as participants among 80 applications from 38 countries. The course was composed of lectures, practical sessions and an excursion. The lectures covered protection systems of both tangible and intangible cultural property in Japan, basic insights into Japanese paper, traditional conservation materials and tools. The practical sessions were led by instructors from a certified group holding the Selected Conservation Techniques on “Restoration techniques for mounts.” The participants gained experience of restoration work of paper cultural property from cleaning it to mounting it in a handscroll. Japanese-style bookbinding and handling of folding screens and hanging scrolls were also included in the sessions. The excursion to the cities of Nagoya, Mino and Kyoto, arranged in the middle of the course, offered an opportunity to see folding screens and sliding doors in historic buildings, the Japanese papermaking which is designated as an Important Intangible Cultural Property of Japan (Honminoshi), a traditional restoration studio, and so forth. On the last day, the conservation materials for paper cultural properties and approach to the selection of appropriate materials for paper conservation were discussed. 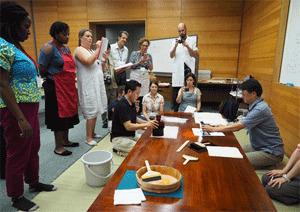 The participants could gain a deeper understanding of not only conservation materials and tools used in Japan but also conservation approaches and techniques using Japanese paper throughout this course. We hope that the knowledge and techniques they acquired in the course will be applied to conservation and restoration of cultural property overseas. 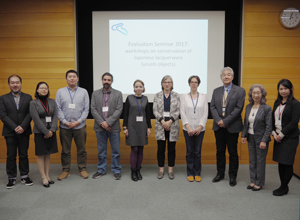 Two workshops on the conservation of Japanese textiles were jointly organized by Tokyo National Research Institute for Cultural Properties (TNRICP) and National Taiwan Normal University (NTNU) for the purpose of preservation and utilization of Japanese textiles overseas. A basic workshop “Cultural Properties of Textile in Japan” was held from August 8th to 10th and an advanced workshop “Conservation of Japanese Textile” was held from August 13th to 17th, 2018. Both were conducted at the Research Center for Conservation of Cultural Relics in NTNU by researchers specialized in textiles and conservators from Japan and Taiwan. The participants were conservators, researchers and students; the basic course had nine participants from six countries and the advanced one had six participants from five countries. The basic workshop started with lectures on the systems of protection of tangible and intangible cultural properties, and moved its focus to fibers and threads as textile materials and some of the representative textiles in Japan. Following the lectures, the participants also experienced folding and displaying Japanese garments (kimono). The practical work on making a paper model of kimono helped the participants to understand the general way in which kimono is constructed from a bolt of fabric. The first half of the advanced workshop focused on the identification of dyes, surface cleaning and wet cleaning. The latter half introduced a Japanese approach to textile conservation and treatment, and the participants experienced stitching a support silk fabric to the back side of an old textile fragment and making an enclosure for it. In both workshops, there were lectures on case studies, and various methods of the display and conservation of Japanese textiles were shared. It served as an opportunity to comprehend conservation materials and application methods as well as textile materials and techniques. Similar projects will continue to be implemented with the aim of contributing to not only the conservation and utilization of Japanese tangible textile objects abroad, but also the preservation of related intangible cultural properties. The International Course on Conservation of Japanese Paper was run from August 28th to September 15th, 2017. This course has been jointly organised by the Tokyo National Research Institute for Cultural Properties (TNRICP) and the International Centre for the Study of Preservation and Restoration of Cultural Property (ICCROM) since 1992. It is aimed at contributing to the protection of cultural property outside Japan by disseminating the knowledge and techniques of conservation and restoration of paper cultural property in Japan to participants from around the world. This year, 10 specialists in conservation from 9 countries (Argentina, Australia, China, Czech Republic, Greece, Israel, Latvia, the Philippines and the USA) were selected as participants among 79 applications from 38 countries. The course was composed of lectures, practical sessions and excursions. The lectures covered protection systems of both tangible and intangible cultural property in Japan, basic insights into Japanese paper, traditional conservation materials and tools. The practical sessions were led by instructors from a certified group holding the Selected Conservation Techniques on “Restoration Techniques of Mounting.” The participants gained experience of restoration work of paper cultural property from cleaning it to mounting it to a handscroll. Japanese-style bookbinding, and handling of folding screens and hanging scrolls were also included in the sessions. The excursion to the cities of Nagoya, Mino, and Kyoto, arranged in the middle of the course, offered an opportunity to see folding screens and sliding doors in historic buildings, the Japanese papermaking (Honminoshi) which is designated as an Important Intangible Cultural Property of Japan, a traditional restoration studio, and so forth. On the last day, the present situation and issues with a focus on paper cultural property in each country such as conservation materials and environmental control were discussed. 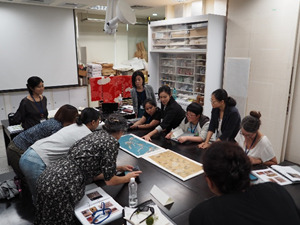 The participants could acquire a deeper understanding not only on conservation materials and tools used in Japan but also conservation approaches and techniques using Japanese paper throughout this course. We hope that the knowledge and techniques they gained in the course will be applied to conservation and restoration of cultural property overseas.